Less than 24 hours later, we find that there’s more to the new-release movies-on-iTunes story. Today Apple announced that new movie releases from major film studios are available for purchase on the iTunes Store the same day as their DVD release. The day before, Jeff Bewkes, the Time Warner chief executive, let slip on a conference call that Warner Brothers studio will now release movies for video-on-demand systems the same day they are released on DVD. Joining Warner Brothers are 20th Century Fox, The Walt Disney Studios, Paramount Pictures, Universal Studios Home Entertainment, Sony Pictures Entertainment, Lionsgate, Image Entertainment, and First Look Studios. 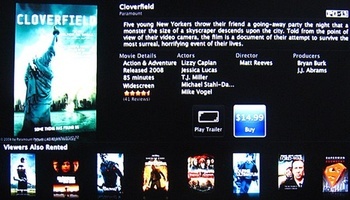 Privately-held CinemaNow and Blockbuster’s Movielink already offer similar services, but new-release movies on iTunes are expected to expand the digital download market. Not yet. Movies purchased via the Internet represent only 1.2 percent of the $36 billion movie industry market, but that’s expected to grow to 4.2 percent of a projected $40 billion market by the end of 2009, according to industry estimates (via Reuters). What will push digital downloads is the availability to rent movies via the Web the same day they are available for purchase and rental as physical DVDs. That day isn’t here yet, but it’s coming. “This is actually a big deal because when they [Apple] were able to get parity [with the music industry on CD release dates] on the music side, they were able to drive music sales,” analyst Shannon Cross of Cross Research told Reuters.